For almost six hours, one of the leaders of the resistance to Nicaraguan President Daniel Ortega hid in a house while police and paramilitary groups laid siege to the last opposition stronghold, which finally fell this week. [post_ads]While hooded men celebrated the capture of the Monimbo neighborhood in the city of Masaya on Tuesday, the leader, who uses the name "Guardabarranco" - Nicaragua's national bird - told of how he fled westwards in fear on a motorbike. Covering his face with sunglasses and a cloth the colors of the Nicaraguan flag, the 28-year-old leader, who declined to give his real name for fear of reprisals, is one of hundreds of government opponents fleeing the crackdown by pro-Ortega forces. "The big hunt is under way and we have a price on our heads," said Guardabarranco, who took refuge in several safe houses and spent the night in the mountains before reaching his current location, which he asked remain secret to protect him. "They're going house by house, taking us one by one," he added, saying the leaders had separated for their own safety. Supported by armed Ortega loyalists, security forces are hot on the heels of resistance leaders along the coast, lakes and mountains of the Central American country of 6.2 million people, accusing them of "terrorism" for opposing the government. "Our biggest sin was to protest against those who taught us to protest," said Guardabarranco. "But we're reorganizing already, because if there's something we Nicaraguans know about, it's kicking out dictators. We kicked out Somoza, and we're going to kick out Ortega, too." Guardabarranco said he helped organize the escape of dozens of fellow rebels from Masaya, the center of the protests. But many are still risking their lives fleeing through rugged mountains and sleeping in the open, even injured, he said. The protests center on government control of the media, accusations of electoral fraud, abuse of the justice system and graft, as well as fears that Ortega is establishing a "family dictatorship" with his wife, Vice President Rosario Murillo. Ortega and Murillo deny the accusations, saying the protesters want to destabilize the country. On Monday, the Sandinista-controlled National Assembly approved a law that empowers the state to send anyone guilty of financing "terrorism" to prison for 15 to 20 years. 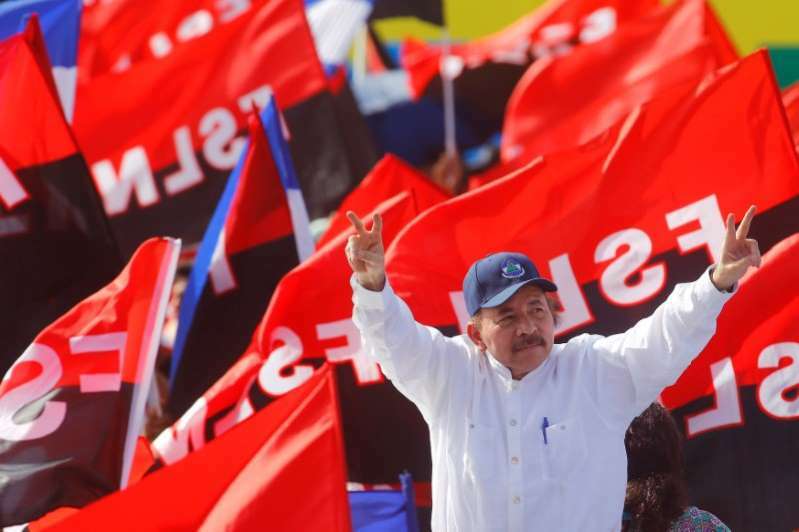 Civil society groups and the United Nations have criticized the law for criminalizing peaceful protests, and fear that it could swell the ranks of political prisoners in Nicaragua. Despite the law, the Roman Catholic Church is harboring many protesters fleeing pro-Ortega security forces. "It's a risk we run, but we can't stand aside when people need us," said Leonel Alfaro, vicar of Managua's cathedral. Showing hands scarred by bullet holes, a 29-year-old calling himself "40" was one of 40 young protesters at one point given refuge inside the cathedral by church authorities. With his face covered by sunglasses and a T-shirt pulled over his head, "40" related how he escaped from Monimbo this week with bullets lodged in both hands, and fled through the Masaya lagoon, spending a night wounded in the cold rain. "We do not want more deaths," said "40." "We want Mr. Daniel Ortega to understand that the people don't want him anymore, the people want a change."